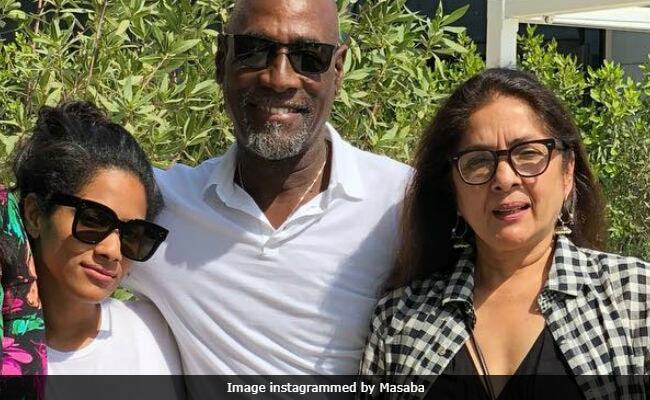 A family reunion was on the cards for designer Masaba, who joined her father Viv Richards' birthday celebrations with her mother Neena Gupta. Masaba shared a picture from the gathering on Instagram with a Carpe Diem-theme message. "It's been a bit astonishing, how short life can be... which is why I dropped every single 'important' thing I was doing to come surprise my dad on his birthday today and even had an impromptu family reunion. Missing the husband, though," she wrote. Masaba is married to Phantom Films co-owner Madhu Mantena. Masaba was born to Neena Gupta and Vivian Richards, former West Indies cricketer, when they were in a relationship in the Eighties. Neena Gupta is now married to chartered account Vivek Mehra while Viv Richards is married to Miriam. Last year, Masaba tackled trolls like a boss when she was called "illegitimate west Indian" for supporting cracker ban. She posted a lengthy statement addressed to the social media trolls, in which she said: "Call me these names if it makes you feel glorious. But know this... I am a proud Indo-Caribbean girl who doesn't know how to shrink and crumble in shame of something you or your society cannot handle. It's just in my 'illegitimate' genes." Masaba is a top designer and her fashion label, House of Masaba, is a favourite of Bollywood celebrities such as Alia Bhatt, Sonam Kapoor, Shilpa Shetty and Mira Rajput among others. Neena Gupta has featured in several television shows such as Ladies Special and Saas, which she also directed.